MOSCOW, March 21. /TASS/. Doctors from the International Committee of the Red Cross (ICRC) have visited Kirill Vyshinsky, director of RIA Novosti's Ukraine branch, who is held in prison in Ukraine, Russian human rights ombudsperson Tatyana Moskalkova said on Thursday. "After my request to the Red Cross, doctors have visited him. They took the matter under their own control and said that his condition is satisfactory," Moskalkova said. The ombudsperson reminded that she asked international organizations to help Vyshinsky. In particular, she contacted Council of Europe's Human Rights Commissioner Dunja Mijatovic and Council of Europe's Secretary General Thorbjorn Jagland. "My requests were not left unanswered, and almost all of them received a negative response when it comes to infringing on the rights of journalists. 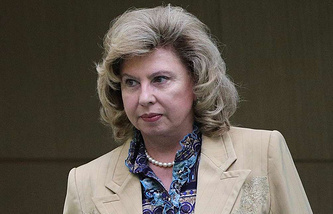 This is a very dangerous precedent that threatens democracy in any country," Moskalkova noted. Ukraine's security service detained Vyshinsky on May 15, 2018 and charged him with high treason and illegal possession and carrying of firearms. The Kherson city court arrested him on May 17 for two months. The arrest has been prolonged several times since. He faces a prison term of up to fifteen years.